Marty learned that God wanted him to concentrate on bringing the blessing, not worrying about trying to receive one! 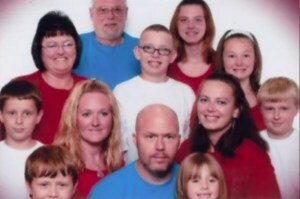 This is a family photo of people talked about here and in the video. A few years ago I struggled with how to “break into” doing comedy for a living. I was very concerned and motivated to figure out a way to increase my performance fee and book as many gigs as possible in order to make a living doing comedy. At some point around three years ago I let all of that go and started focusing on a simple principle. I decided I would work on “being a blessing” instead of searching for one. So that is how I have continued for the past three years and it has brought me great joy. There are many stories I could relate via a blog but none have been as encouraging as the one that happened this past week in a small town named Lancaster, South Carolina, just south of the larger metropolis of Charlotte, North Carolina. As a comedian, I have this little cynical voice in my head whenever I’m driving to a small-town gig which predicts how well the show will go based on how far off the interstate the show actually is. The farther off the interstate, typically the tougher the crowd. This show was 40 miles from the interstate exit. I went in with very low expectations, but a little whisper in my ear reminded me as I walked through the gravel parking lot into the venue, “Be the blessing tonight, don’t worry about receiving one.” So I calmly prayed to God to use my comedy to help bless the people in the audience tonight, and I meant it. As I sat for dinner pre-show with the pastor of this little church he relayed story after story of the things that God was doing through and to this church. Dozens of his people came over and discussed things with him that let me know this little ministry was full of good folks. I started to get more and more optimistic about this show the longer I spent time with these people. The show was great. It was a perfect storm of snappy customized crowd work for a spirit filled crowd who was ready to receive it matched with my normal material which was just perfect for this particular crowd. I had a blast. It truly was a great experience for me and I felt blessed by the crowd. Then after the show as people came to my merch-table to talk and what not, it happened. Faye Putnam gave me what I think is probably the best word of encouragement I have ever received as a comedian. She very calmly stated that her husband had passed away just one month earlier and that he loved stand-up comedy. I lost my husband on December 20, 2013 and he would have so enjoyed your show. My husband had a funny laugh and during your show, the entire night, I could hear my him laughing so hard that I could see him rolling in the floor. Marty that did my heart a world of good and made me feel like myself again. Thank you so much. And here I was just two hours earlier thinking since I drove 37 miles on a two-lane road that the show tonight wasn’t going to go well. Shame on me. In the comedy world we use terms about how well we did that are violent. Usually the more violent the better in terms of laughter. So to say someone is “destroying the room” or “he murdered that crowd” would mean the comic was doing really well. “Killing” is another common way to describe doing well in comedy. So the irony here is I was able to do the opposite of what we would typically describe this show as. I indeed “killed.” But this show was such a blessing to one woman that she was able to envision her husband, who recently passed away, actually AT THE SHOW and enjoying himself. To hear that from Mrs. Putnam was truly a blessing to me. ​So, by concentrating on bringing the blessing with me, instead of searching for MY blessing, God was able to use my comedy to bless me anyway. That makes me happy. Want to learn more about how to have Marty speak at or perform comedy at your next event? You can get in touch with his booking agency here.